Sewing on a Budget | Super Stay At Home Mommy! « Welcome to my new blog!! I am crazy about saving money! I’m a coupon clipper, bargain hunter, and get a thrill over finding a good deal. So, of course, when I started sewing I had to find a way to do it on a budget. The first few projects I made I found myself spending WAY too much money. By the time you get the pattern, fabric, notions, thread, etc, it really starts to add up. I needed to find a way to make things cheaper- especially since I plan to make my daughter’s entire Spring and Summer wardrobe. That’s when my wonderful mother-in-law stepped in and suggested “upcycling” (recycling) old clothes, sheets, etc. I couldn’t be more excited about the idea. We took a trip to Good Will and went crazy! I came home with a great stash and have been back a couple times for more. I’d say that I have probably saved at least $200 in fabric costs. It’s also amazing all of the notions you can find at the thrift store, too. I have a stash of bias tape, and am working on gathering up some buttons, zippers, and elastic too. Many of the dresses we found to upcycle had buttons and zippers on them which can be reused too. The zippers take a little more effort, but it can be done! The savings probably isn’t as much here just yet- I’d say about $20. But every penny counts! Patterns seemed to still be the part where I struggled and spent a little too much money…. However, searching the internet I found countless free tutorials that have been great. I also keep an eye out for deals at JoAnn’s. 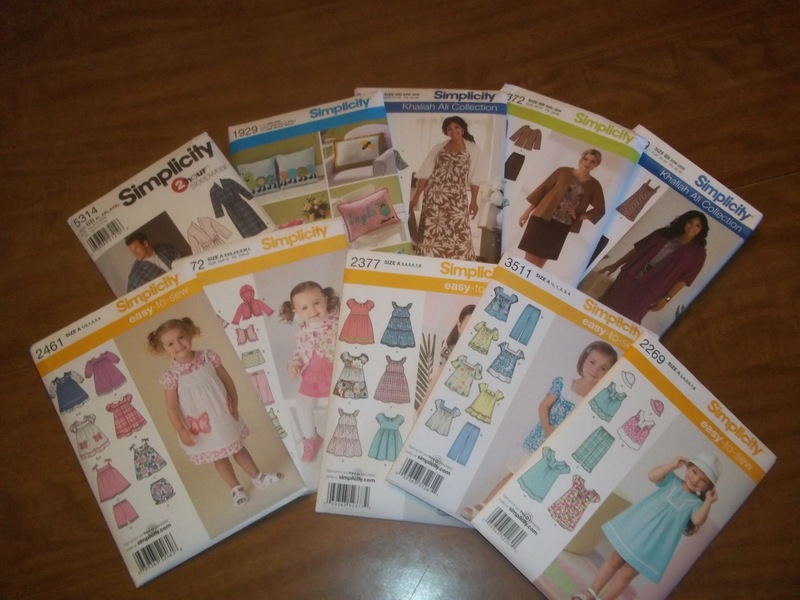 Just last weekend they had a deal for 5 Simplicity patterns for $5. I took advantage of it, purchased 10 patterns, and saved over $130!!! Take a look at this score! Original prices range from $11.95-$17.95 a piece! I got them for a dollar each! When it comes to thread costs, I keep it simple. Black or white thread can pretty much be used for any project. So, rather than buying new thread to match each and every project, I just always keep black and white thread on hand. I’ll continue sharing tips and ideas, as well as deals I find! Have you made or looked into pillow case dresses? 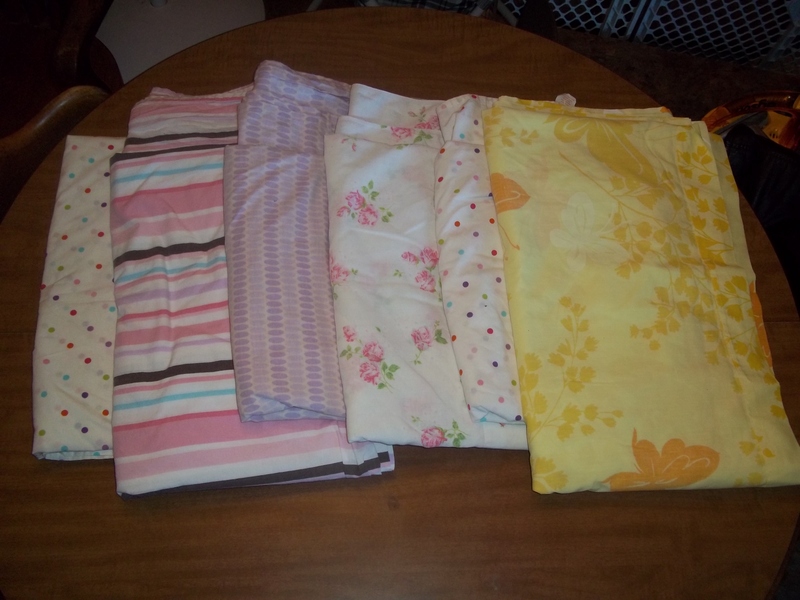 Those are really cute and I bet you can find great thrift store pillow cases! Your daughter is so lucky to have a mommy who makes her things. You have just given me really great incentive to go thrifting!! I love those sheets, especially the floral prints (I see quilts!). Sewing does get pricey and I’m always on the look out for great deals. I’m so glad! You will be amazed at all the great stuff you’ll find for cheap! Can’t wait to hear what you find!